Given the analog production MO employed on this album, I'm not sure the CD/redbook audio release can present the full listening experience. If you can check it out on its LP release, you'll encounter a lush analog sonic space of magnetic tape chorus and delay effects, etc. 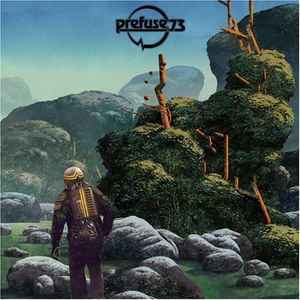 If brevity is the soul of wit, then Prefuse 73's EVERYTHING SHE TOUCHED TURNED AMPEXIAN should be a laugh riot. But what it actually turns out to be is a psychedelic turn for Mr. Herren. The tracks morph quickly, with most having a touch of lightness to them, even on the beat-driven tracks like "Punish." But in most cases, if you don't like what you hear, wait a minute or so. You can sample the funk of "Half Up Front" or the Detroit robotics of "DEC. Machine Funk All ERA's." Jungle sounds rule the day in "When Is A Good Time?," while an lo-fi easy listening vibe jingles into "Fountains Of Spring" and folksy riffs of "Regalo." "No Lights Still Rock" brings in Dimlite for a mix of the archaic and the silly, for "Preperation's Kids Choir" to pick up later before "Formal Dedications" closes things out on a deeper note. Makes one wonder if everything that Mr. Herren touches also turns ampexian. Often criticized for it's short track lengths, I personally feel this album is one of the better ones out of his discography. It rivals One Word Extinguisher, too bad that his later albums don't sound like either.